Your day-by-day itinerary now includes National Museum of Ireland - Archaeology as well as Jeanie Johnston Tall Ship and Famine Museum. There's lots more to do: contemplate the long history of Kilmainham Gaol, brush up on your knowledge of spirits at The Old Jameson Distillery, wander the streets of Temple Bar, and admire the landmark architecture of Dublin Castle. To find maps, where to stay, other places to visit, and more tourist information, you can read our Dublin online itinerary creator. Use the Route module to find suitable travel options from Quebec City, Canada to Dublin. The time zone difference moving from Eastern Standard Time to Greenwich Mean Time is 5 hours. Expect a bit cooler temperatures when traveling from Quebec City in June; daily highs in Dublin reach 20°C and lows reach 10°C. Finish your sightseeing early on the 18th (Sun) so you can drive to Killarney. 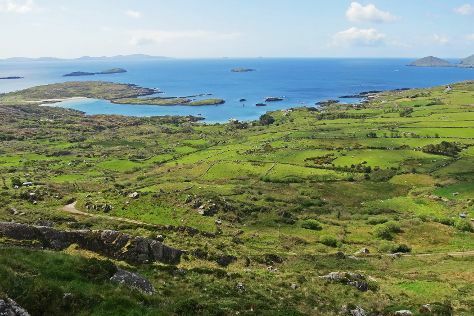 You've now added Ring of Kerry to your itinerary. Next up on the itinerary: steep yourself in history at Muckross House, Gardens & Traditional Farms, take in the dramatic scenery at Torc Waterfall, step into the grandiose world of Ross Castle, and make a trip to Ladies' View. To find traveler tips, reviews, ratings, and other tourist information, go to the Killarney sightseeing planner. Drive from Dublin to Killarney in 3.5 hours. Alternatively, you can fly; or take a train. In June in Killarney, expect temperatures between 20°C during the day and 13°C at night. You will leave for Galway on the 21st (Wed). Explore Galway's surroundings by going to Bunratty Castle and Folk Park (in Bunratty) and Aillwee Cave (in Ballyvaughan). The adventure continues: cruise along Wild Atlantic Way, don't miss a visit to Quay Street, admire the landmark architecture of Galway Cathedral, and appreciate the extensive heritage of Salthill Promenade. For more things to do, traveler tips, other places to visit, and more tourist information, use the Galway custom trip planner. You can drive from Killarney to Galway in 2.5 hours. Alternatively, you can take a bus. In June, daily temperatures in Galway can reach 20°C, while at night they dip to 12°C. Cap off your sightseeing on the 24th (Sat) early enough to travel back home.